Often young people just starting out on their careers need some help to get them on their way. And it’s no different for young farmers — just ask Ron Taylor of Tallassee, Ala.
A fifth-generation cotton farmer, Ron began working on the family farm as a teenager and, when his father passed away 10 years ago, he took on full responsibility for his piece of the farm. With that responsibility came the need for financing for farm operating needs, newly purchased land on which to expand, and a home for his family of four on the property. Ron previously financed with the Farm Service Agency, but as his operation grew, he saw the need to find another lender. After meeting with Alabama Ag Credit’s Ben Elliott at a cookout that the cooperative hosted for local farmers, he decided to move his business to Alabama Ag Credit. The move allowed him to consolidate many of his obligations by having a single lender for all his financing needs — and Ben, branch manager in the Montgomery office, became a trusted friend and advisor. Ron and his wife, Jessica, exchange knowing looks, smile and chuckle quietly when asked why Ron decided to take on the family farm. Sometimes with the long days and the ever-growing costs of doing business, they ask themselves that too. 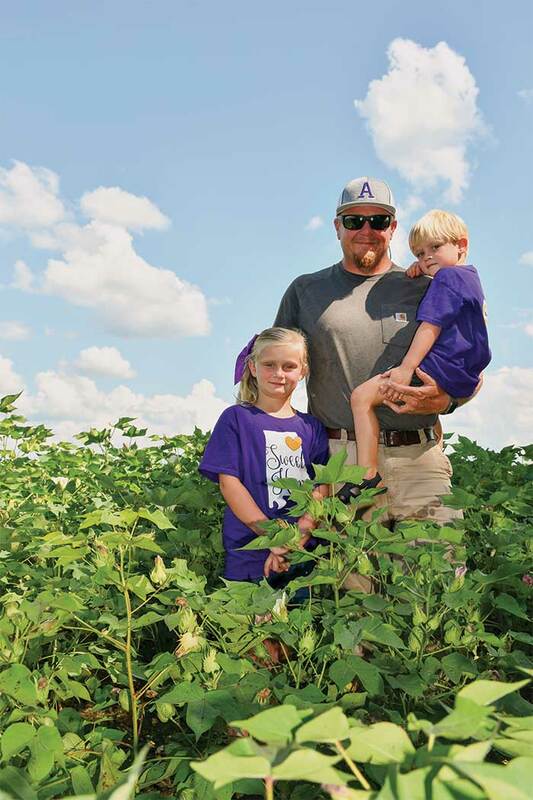 The answer is that they can provide for and spend time with daughter, Kylie, 7, and son, Mason, 3, while continuing the legacy of a fifth-generation cotton farm in Elmore County. When Landscapes magazine caught up with Ron, he was in the field preparing to spray for green stink bugs, which can pierce bolls and cause losses due to reduced yields and fiber quality. The cotton fields were beginning to flower, some white, some starting to turn pink from pollination, getting ready to form bolls that will open to produce the white cotton fibers. Cotton typically blooms in mid to late August and by mid-September into October is ready to pick. Fortunately, Ron has help from his uncles and cousins who farm on land adjacent to his own. With shared equipment and close proximity, they often share resources, and it’s all hands on deck during harvest season, trying to get the work done in the most efficient way possible. Once harvested, the cotton will be stored in modules — which hold between 6,500 and 7,500 pounds —for protection against the weather until it’s time to be taken to the gin. Ron’s cotton will be marketed by Staplcotn, headquartered in Mississippi and one of the largest cotton cooperatives in the United States, which will market it to the world. Ron is hesitant but hopeful when asked about his children someday taking over the cotton farm. Factors such as rising input costs, and the dependence on Mother Nature to provide enough water make cotton farming difficult. This year looks to be a good crop for the Taylors as long as conditions continue to hold, but every year can be a gamble. But if the children do want to take over the farm someday, hopefully it will be with the support of a good lender like Alabama Ag Credit. The 2018 Dixie Softball World Series Champion team includes, front row, from left to right: Anna Claire Turner, Kennedy Bickley, Kylie Taylor, Chas Stokes and Cay Cay Jones. Back row, from left to right: Z’Riyah Alleyne, Zion Alleyne, McCall Clayton, Zadie Stephens and Cookie Fitzpatrick. Coaches, from left to right: Ron Taylor, Jessica Taylor, Brent Tennyson and Adam Clayton. Customer Ron Taylor’s relationship with Montgomery Branch Manager Ben Elliott and Alabama Ag Credit grew when his daughter, Kylie, made All-Stars for Tallassee’s Dixie Youth 6U softball team and he chose to be head coach for the team. 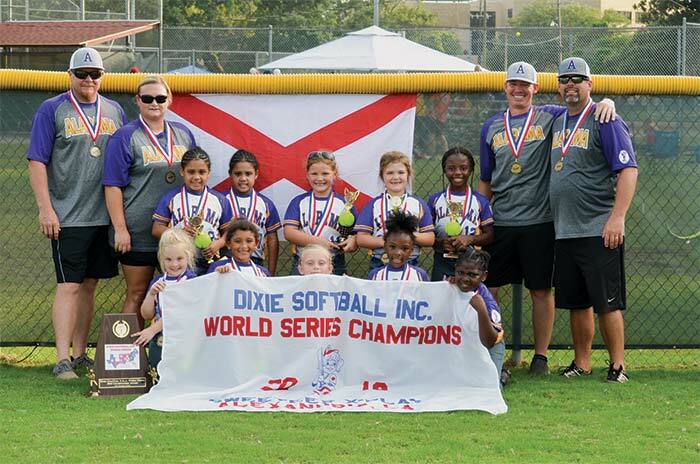 Alabama Ag Credit sponsored the team, which went to the 2018 Dixie Softball World Series tournament and came back with a 25-0 record and a World Series Championship title. Alabama Ag Credit’s mission of providing sound, constructive credit and financial services applies to enhancing the quality of life for the people in the agricultural industry and also in the rural communities in which they live. Supporting this mission, you will often see Alabama Ag Credit employees and directors at local community events sponsoring various activities and cheering on those they live and work with every day. Alabama ranks in the top 10 cotton producing states each year. Cotton is grown in 59 of Alabama’s 67 counties. The cotton industry provides more than 340,000 jobs and generates over $60 billion in the U.S.
One bale of cotton can make 215 pairs of jeans; 249 bed sheets; 313,600 $100 bills; 690 bath towels; or 1,217 T-shirts. Cottonseed oil is used in snack foods, mayonnaise, margarine, baking and frying oils, explosives, cosmetics, rubber, soap and insecticides.